When will Indian cities be WiFied? What is the true number of Internet users in India? When will India reach the 100 million Internet users mark? In this episode, Internet & Mobile Association of India President Subho Ray answers these questions and more. Established in 2004, IAMAI is the only industry association in India representing the collective voice and interests of the online and mobile content industry. As president, Subho heads the permanent secretariat of the association and is currently responsible for conceptualizing and implementing the association’s activities around regulatory affairs, industry standards, research, communications and promotional events. Before joining IAMAI, Subho was the director for the ICT vertical at the Confederation of Indian Industry in New Delhi, where he worked since 1998. His other significant roles in CII have been as head of Internal Communications and an overseas stint at the Confederation’s London office. Subho has also taught at the School of Oriental and African Studies at University of London and worked as a research assistant at the Indian Council for Historical Research, New Delhi. He read history at Presidency College, Kolkata and Jawahar Lal Nehru University, New Delhi and received his PhD from the University of London. He has also co-authored the history of CII which will soon be published in India by Penguin. 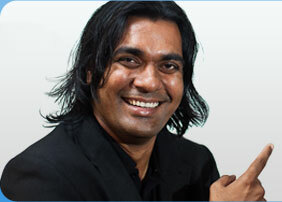 Xerago CEO Ganesh Mandalam reveals success secrets. Ever wonder if all successful CEOs come with MBAs in hand? Do successful CEOs even have time to fall in love or do they spend every waking hour working or thinking about work? What does it take to make it in the competitive world of online advertising and marketing business? Listen to this episode as we get upclose and personal with Ganesh Mandalam, founder and CEO of Xerago, and get his to answer all these questions and more. Xerago is a pioneering digital marketing solutions and customer management consultancy that offers business and technology solutions to companies interested in improving their customer acquisition and retention. Ganesh began his career in advertising at TakeWings Advertising agency and, briefly, with Ogilvy & Mather before turning to entrepreneur with 3rd Agenda, one of India’s pioneers in web commerce (way back in 1997). Two years later, he sold 3rd Agenda to SSI Technologies (which has changed its name twice since then: First to Scandent, and now Cambridge Solutions Ltd.) and continued being its CEO till 2001. In the interim, he also co-founded BrideOverTW, a pureplay online advertising agency that still continues to function. In 2002, SSI decided to shut down 3rd agenda as part of its restructuring, and that’s when Ganesh founded Xerago, which rightly means ‘Second coming’. Since then, there’s been no looking back as Xerago has attracted big ticket clients. Currently, the company is 100 people strong. In this freewheeling interview, Ganesh talks about his company, his business model and his interests. In this edition, I have a conversation with Rajesh Setty, a Silicon Valley-based tech entrepreneuer who stands out brilliantly for his leadership and his varied interests. Rajesh currently serves as the president of Foresight Plus. He is also the chairman of CIGNEX Technologies, which he founded in 2000 (and seen grow by 250 percent every year). Rajesh is a popular invited speaker and an author. He recently published a book called Life Beyond Code – Learn to distinguish yourself in 9 simple ways. He targets this book especially for IT professionals and how they can raise themselves from the crowd and be remarkable. I recently got to read his book and was impressed with its simplicity. He had obviously distilled 10 years of experiences and put them neatly in a book that can be finished in 3 hours. What caught my attention was his well-maintained blog (here) and how he effectively uses it to author his future books. Every blog entry contributes to a part of his upcoming book. I had always wanted to author a book myself and this novel approach impressed me. In this interview, Rajesh talks about many things that would not only be inspirational but also very useful. Listen on.